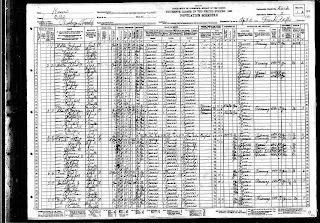 1900 US Federal Census, Neuchatel, Nemaha County, Kansas. James Ross is the head of household. He was born in Illinois in June 1855 (44 years). His mother and father were both born in Ireland. By 1900 he was a widowed. He was a farmer by trade and owned his own farm free (no morgage). He could read, write, and speak English. Mamie Ross is the daughter of James. She was born in Kansas in December 1882 (17 years). Her father was born in Illinois and her mother was born in Kansas. She is single and not employed. She could read, write and speak English. Albert Ross is the son of James. He was born in Kansas in January 1885 (15 years). His father was born in Illinois and his mother was born in Kansas. He is single and a farm laborer by trade for six months of the year. The other six months of the year he attended school and could read, write, and speak English. Charles Ross is the son of James. He was born in Kansas in February 1887 (13 years). His father was born in Illinois and his mother was born in Kansas. He is single and farm laborer by trade for six months of the year. The other six months of the year he attended school and could read, write, and speak English. George Ross is the son of James. He was born in Kansas in May 1889 (11 years). His father was born in Illinois and his mother was born in Kansas. He is single and farm laborer by trade for six months of the year. The other six months of the year he attended school and could read, write, and speak English. Edward Ross is the son of James. He was born in Kansas in July 1890 (9 years). His father was born in Illinois and his mother was born in Kansas. He is single and unemployed. He attended school for six months of the year and could read, write, and speak English. Katie Ross is the daughter of James. She was born in Kansas in April 1893 (7 years). Her father was born in Illinois and her mother was born in Kansas. She is single and not employed. She attended school for six months of the year. Frank Ross is the son of James. 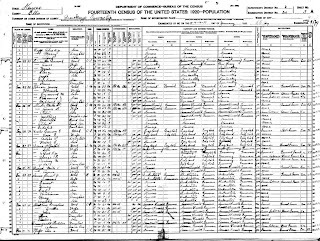 He was born in Kansas in June 1896 (3 years). His father was born in Illinois and his mother was born in Kansas. He is single and unemployed. Freddie Ross is the son of James. 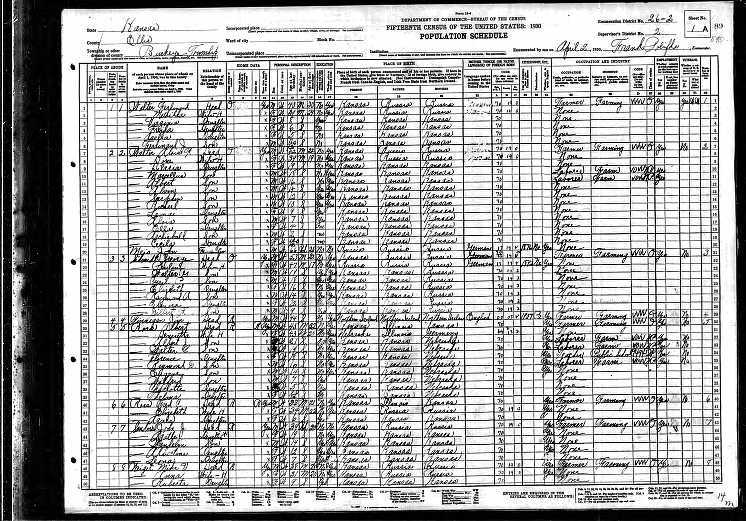 He was born in Kansas in June 1896 (3 years). His father was born in Illinois and his mother was born in Kansas. He is single and unemployed. James Ross is the head of household. He is 54 years old widower, and was born in Illinois. His mother and father were both born in Ireland. He spoke English and worked as a Farmer. He could read and write. He owned his farm mortgaged. 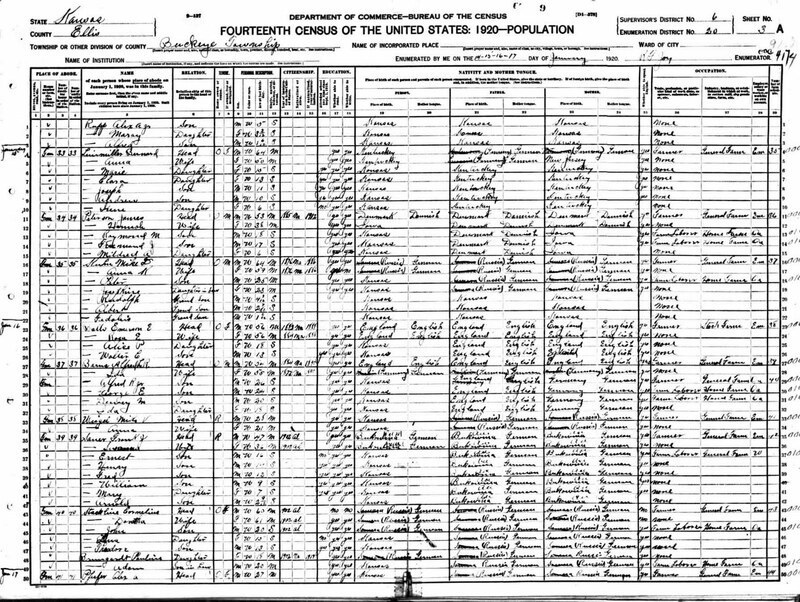 Albert T. Ross is the son of James. He is 24 years old and married. He was born in Kansas. His father was born in Illinois and his mother was born in Kansas. He could read and write. He spoke English and was unemployed. George F. Ross is the son of James. He is 19 years old and single. He was born in Kansas. His father was born in Illinois and his mother was born in Kansas. He could read and write. He spoke English and was unemployed. He had not attended school since September 1909. Edward J. Ross is the son of James. He is 15 years old and single. He was born in Kansas. His father was born in Illinois and his mother was born in Kansas. He could read and write. He spoke English and was unemployed. He had attended school since September 1909. Francis J. Ross is the son of James. He is 13 years old and single. He was born in Kansas. His father was born in Illinois and his mother was born in Kansas. He could read and write. He spoke English and was unemployed. He had attended school since September 1909. Frederick Ross is the son of James. He is 13 years old and single. He was born in Kansas. His father was born in Illinois and his mother was born in Kansas. He could read and write. He spoke English and was unemployed. He had attended school since September 1909. Henrietta M. Ross is Jame's daughter in law. She is 23 years old and married to Albert T. Ross. They have been married for 3 years. She has given birth to 2 children, both of which are living. She was born in Nebraska, her father was born in Missouri and her mother was born in Germany. She could read and write. She spoke English and was unemployed. Albert J. Ross is the grandson of James and the son of Albert T. Ross and Henrietta. He is 1 year old and was born in Kansas. His mother was born in Nebraska and his father was born in Kansas. Charles W. Ross is the grandson of James and the son of Albert T. Ross and Henrietta. He is 3 months old and was born in Kansas. His mother was born in Nebraska and his father was born in Kansas. Albert T. Ross is the head of household. He is a 35 year old and was born in Kansas. He is married and rents his farm. His father was born in Illinois and his mother was born in Kansas. He can read and write English and is a farmer by trade. Henryetta is the wife of Albert. She is 33 year old and was born in Nebraska. Her father was born in Missouri and her mother was born in Germany, and spoke German. She can read and write English and was unemployed. 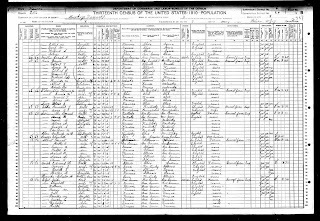 Albert J. Ross is the son of Albert and Henryetta. He is 11 years old and was born in Kansas. Both his mother and father were born in Kansas. He had attended school since September 1919 and could read and write English. 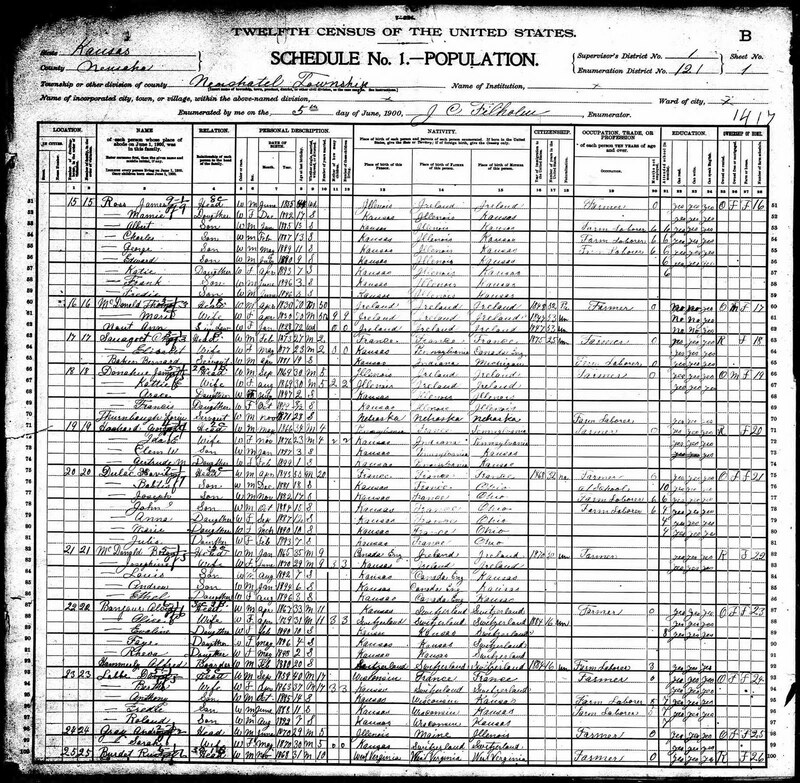 Walter C. Ross is the son of Albert and Henryetta. He is 9 years old and was born in Kansas. Both his mother and father were born in Kansas. He had attended school since September 1919 and could read and write English. 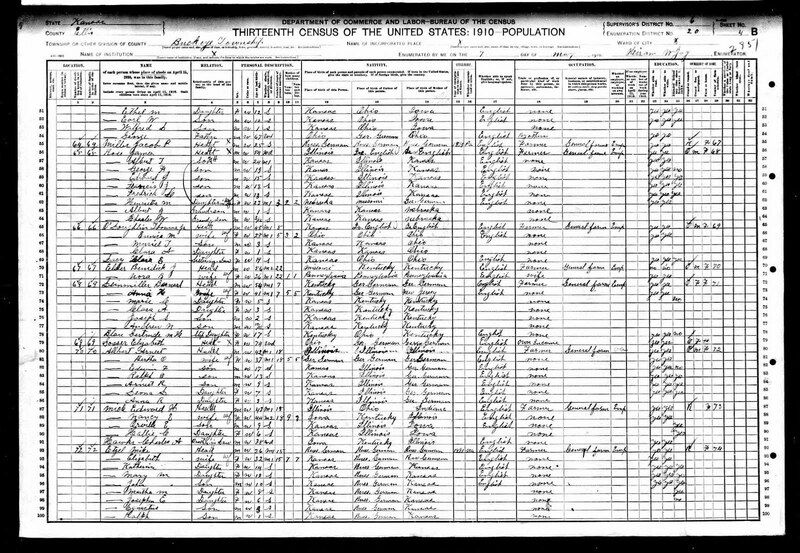 Florence E. Ross is the daughter of Albert and Henryetta. She is 8 years old and was born in Kansas. Both her mother and father were born in Kansas. She had attended school since September 1919 and could read and write English. Raymond Ross is the son of Albert and Henryetta. He is 6 years old and was born in Kansas. Both his mother and father were born in Kansas. He had attended school since September 1919 and could read and write English. Eugene Ross is the son of Albert and Henryetta. He is 4 years and 5 months old and was born in Kansas. Both his mother and father were born in Kansas. Albert Ross is the head of household. His is 45 years old and was born in Kansas. He rents his farm and owns a radio. He has been married 22 years and can read and write. His father was born in Illinois and his mother was born Kansas. He is a farmer by trade and works of his own account. He can speak English. He is not a veteran. Henrietta is the wife of Albert. She is 43 years old and was born in Nebraska. She can read and write. Her father was born in Illinois and her mother was born in Germany. She can speak English and she is unemployed. Albert Ross is the son of Albert and Henrietta. He is 21 years old and was born in Kansas. He is single. He had not attended school that year and he can read and write. His father was born in Kansas and his mother was born in Nebraska. He could speak English and is a farm laborer by trade. He is a wage or salaried worker. He is not a veteran. 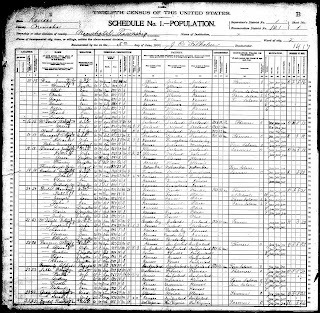 Walter C. Ross is the son of Albert and Henrietta. He is 19 years old and was born in Kansas. He is single. He has not attended school that year and he can read and write. His father was born in Kansas and his mother was born in Nebraska. He could speak English and is a farm laborer by trade. He is a wage or salaried worker. He is not a veteran. Florence Ross is the daughter of Albert and Henrietta. She is 18 years old and was born in Kansas. She is single. She has not attended school that year and she can read and write. Her father was born in Kansas and her mother was born in Nebraska. She could speak English and she is a public school teacher. She receives wages or is salaried. She is not a veteran. Raymond G. Ross is the son of Albert and Henrietta. He is 16 years old and was born in Kansas. He is single. He has not attended school that year and he can read and write. His father was born in Kansas and his mother was born in Nebraska. He can speak English and he is farm laborer by trade. He receives wages or is salaried. He is not a veteran. Eugene Ross is the son of Albert and Henrietta. He is 14 years old and was born in Kansas. He has not attended school within the last year and can read and write. His father was born in Kansas and his mother was born in Nebraska. He can speak English and is unemployed. Winfred Ross is the son of Albert and Henrietta. He is 7 years old and was born in Kansas. He has attended school within the last year. His father was born in Kansas and his mother was born in Nebraska. He can speak English and is unemployed. Charlotte Ross is the daughter of Albert and Henrietta. She is 5 years old and was born in Kansas. She has attended school that year. Her father was born in Kansas and her mother was born in Nebraska. She could speak English and is unemployed. Thelma Ross is the daughter of Albert and Henrietta. She was born recently in Kansas. She has not attended school that year. Her father was born in Kansas and her mother was born in Nebraska.